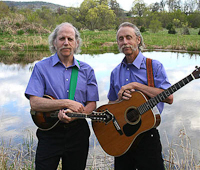 This past Friday, Larry and Anne Reinstein treated us to a performance by Banjo Dan and the Mid-nite Plowboys at the Charles R. Wood Theater in Glens Falls, NY. A poster in the window of the theater billed them as "New England's Best Bluegrass Band." Perhaps they are. Unfortunately, the evening got off to a rocky start. The band arrived late, held up by traffic in Vermont. But after a quick mic check they disappeared off-stage, re-emerged in performance togs, apologized for their tardiness, and gave a delightful performance. Within minutes, the awkwardness of the outset dissipated into the rhythm of the music. They played in a wide range of styles - from gospel to lyrical to bluesy folk - all in the bluegrass mode. Their songs were old and new, edgy and soothing, thought-provoking and entertaining. They traced their roots to Bill Monroe, the "Daddy of Bluegrass Music", and sang a piece by contemporary North Dakota songwriter Ana Egge, with some Dan Fogelberg and Lynyrd Skynyrd in between. 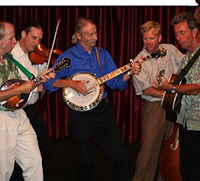 Each of the players - 'Banjo Dan' Lindner (banjo, shown here with a guitar), Willy Lindner (mandolin), Alan Davis (acoustic guitar), John Drake (bass fiddle), and Phil Block (fiddle) - is his own man. Maybe it was his handlebar mustache or his black and white art deco shirt, but I could not help but think of Dan as a member of a barbershop quartet. His brother Willy, with long hair and beard and glowing smile, called to mind the hippie sixties. I imagined the two brothers playing folk songs in dimly lighted, smoke filled, late-sixties cafés. Alan Davis evoked the image of a sad and lonesome cowboy. John the bass player could be a golf pro or a bartender, an insurance salesman or a history teacher, but Wendy was sure he has a past. Phil Block had the look and feel of a brooding and intense musician - and played like one. The stage was set with three microphones. The mic in the center picked up the vocals and the featured instrumentals; the two at the sides amplified the guitar and mandolin. The Plowboys glided from one mic to another like square dancers to create solo riffs, duets, three-part vocal harmonies, and ensemble pieces. They plucked, picked, and sang in crystalline harmony, not just playing together, but creating harmonics off one another's instruments and augmenting one another's chords. The highlight of the evening was a virtuoso performance of Jerusalem Ridge by fiddler Phil Block. Each time he took us through this classic bluegrass piece, the sound became more complex and expressive. By the time he was finished, the room was enrapt. We called them out for a well deserved encore, after which they packed up for Vermont and we drove back to Lake George, happy for the experience.